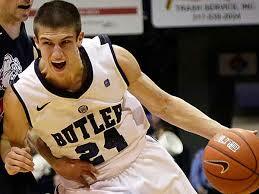 Butler’s Kellen Dunham is going to play in the biggest game of his college career tomorrow night at six. The longer you contend in a race, the more important the next mile is. The college basketball regular season is within a month of ending, and four Indiana teams that suffered a rare shutout from last year’s NCAA Tournament are back in contention for bids. Notre Dame is a done deal. The Irish are going to the tournament. To this point, they are 22-4 with an ACC record of 10-3, and have games remaining against conference bottom dwellers Wake Forest and Boston College among their final five. Assuming those two wins, the worst Mike Brey’s team can finish in the conference is 12-6. Even with a complete collapse otherwise, they are in with a six seed at worst. What happens in the tournament in anyone’s guess because no team in the top 25 has played its starters more minutes – and it isn’t close. Butler plays Villanova at Hinkle Fieldhouse tomorrow night at 6p (CBSSN). With a win, the Bulldogs pull into a tie with Villanova atop the Big East. After finishing the 2013-2014 season in next to last place with a 4-14, Butler has been a revelation in 2014-2015. The confusion surrounding the coaching situation as Brandon Miller mysteriously exited has cleared up nicely with the great work of Chris Holtmann, and Butler is the feel good story of the season. After tomorrow night’s huge game, Butler finishes @ Creighton, @ Xavier, vs. Marquette, @ DePaul, vs. Georgetown, and @ Providence. If Butler can split those six games, and they should be able to do that at the minimum, the Bulldogs will win either 11 or 12 games conference games. That gets them in without a doubt. For Butler, all discussions should center on seeding. With a win against ‘Nova, Butler will put themselves in a position for a three seed. No one is going to want to play Butler in the NCAA Tournament. They are choir boys who wield a sharp dagger without conscience. They get off the team bus, and opponents think they are the a cappella group “Straight, No Chaser”. After 40 minutes of basketball, they wonder how a bunch of singers beat their asses. Purdue is rolling along again after a hiccup at Minnesota. With the win last night at Rutgers, Purdue finds itself in a second place tie in the Big Ten at 8-4 and six games to play. Three of those games are at Mackey Arena against Nebraska, Rutgers, and Illinois. If they play with the same defensive tenacity they’ve shown since the beginning of the Big Ten season, there is no chance the Boilermakers don’t finish 11-7 at worst, and that should get them in. Given the combination of size (A.J. Hammons and Isaac Haas) and quickness/speed (Jon Octeus/Bryson Scott) Purdue brings, they are going to be in a nice position to pull upsets in March. Indiana is the most vexing of the major conference teams in Indiana, and the team that looks safe, but might not be. The Hoosiers are 7-5 in the Big Ten with non conference wins against SMU and Butler to buffet their resume’, but four losses in six games have revealed some flaws and possibly fatigue among freshmen James Blackmon Jr. and Robert Johnson. A soft final six games, including a suddenly perilous contest Sunday against Minnesota – winners of five of its last seven – should allow Indiana to claw its way to 10-8 at worst, and that should get them into the Big Dance. This has been to this point as fascinating a college basketball season as I can remember, and with every game it becomes more difficult to predict what might happen next. Local fans have games to look forward to nearly every night, and on the other nights, we have Kentucky to root against (who wants to see John Calipari become even more smug?). And who among the four Indiana teams that should wind up in the tournament might be positioned to play the deepest? If the old axiom about NCAA Tournament success being tied to guard play, Indiana and Notre Dame have an advantage with Jerian Grant and Yogi Ferrell, but I’m not betting against Purdue and Butler. This entry was posted in Butler Basketball, College Basketball, Featured Story, Indiana Basketball, Kent Sterling, Purdue Basketball and tagged AJ Hammons, Butler Basketball, Butler Villanova, Indiana Basketball, Indiana NCAA Tournament, Isaac Haas, Jerian Grant, Purdue Basketball, Yogi Ferrell on February 13, 2015 by Kent Sterling. All I can say is, I’m glad I’m not playing on any of those teams. The mere idea of “nut cutting” makes me shudder, LOL. Kent – Nice post, especially in regards to Butler. One small quibble however. Your a cappella group of choice should have been Butler’s own all male a cappella group ‘Out of the Dawg House’. My son who attended Butler was a member of the group. Look ’em up on youtube by searching for OOTDH.